What role do video games play in preparing people for disasters? Anthony Gampell speaks to Sarah Nobis about how games can deliver disaster skills training. Why did you take an interest in the topic of disaster games? 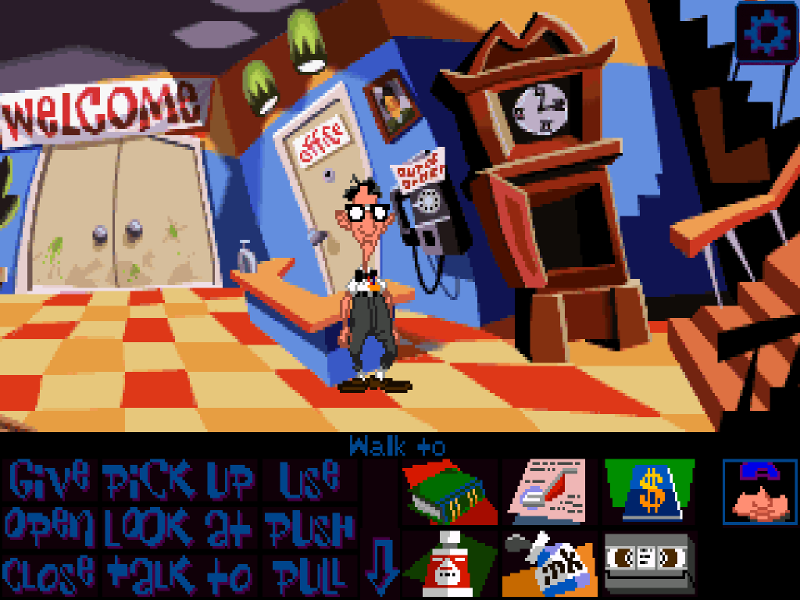 The graphic adventure game Maniac Mansion II: Day of the tentacle, developed and published by Lucasarts, is where my interest in video games began. I was fascinated by the out of the box thinking required to solve problems and complete puzzles. At the same time, I appreciated a humorous outcome it often involved. Thus my interest in anything video game related grew. During my undergraduate degree, I took a stage three geography paper focused upon the social dimensions of disaster, where one of the assignments involved designing an academic poster. I decided to design my poster around the myths and realities of disaster popular culture and found numerous mentions of disaster movies, books, paintings, music, music videos but nothing regarding disaster video games. I therefore decided this was an area lacking research and hence began exploring the topic of disaster video games. What are disaster video games generally about? There is no real definition of what disaster video games are about, as they are all so different. In terms of serious disaster video games, often these games focus upon building players’ awareness in regards to a particular hazard including how to prevent, mitigate and prepare for such disaster events. Mainstream video games vary widely but generally do not feature a heavy awareness building focus. A potential hazard in a mainstream game may fuel the narrative, be a part of the gameplay or even form the location for where the game takes place. 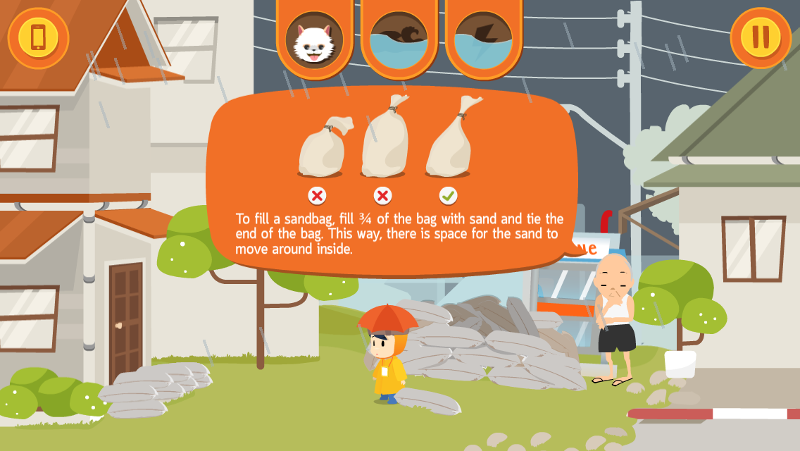 Why and how do you think serious games can serve as a tool to talk about disaster and DRR? Personally, I think all video games – no matter whether they’re serious or mainstream – can serve as tools to talk about disaster and DRR. All video games require active participation from a player; therefore, players are engaged in the process. They are not passive. Players are required to make decisions based upon their experiences and beliefs in order to progress through a video game. Experimentation and play are also key components of video games, which presents an opportunity for players to be creative, explore ideas of ‘what happens if…?’ and, most importantly, have fun. Let’s take the mainstream game Spore as an example. By using the terraforming mechanics, players can observe the impacts of climate change. 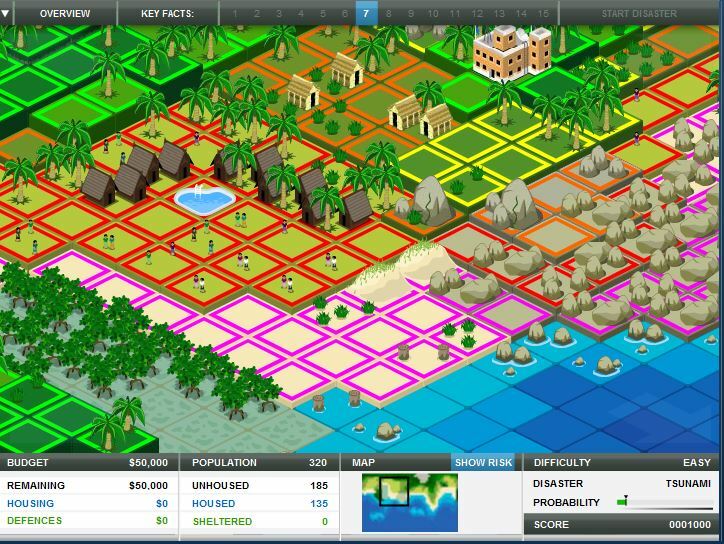 If players heat the planet too much, settlements on the coast are destroyed by the sea level rise. Therefore, they’re giving a visual demonstration of a long-term process upon a much shorter timescale. The discussion surrounding gameplay and player action in turn answers how video games can serve as tools to talk about disaster and DRR. Players share their gameplay experiences and connect ideas to the real world and everyday situations. 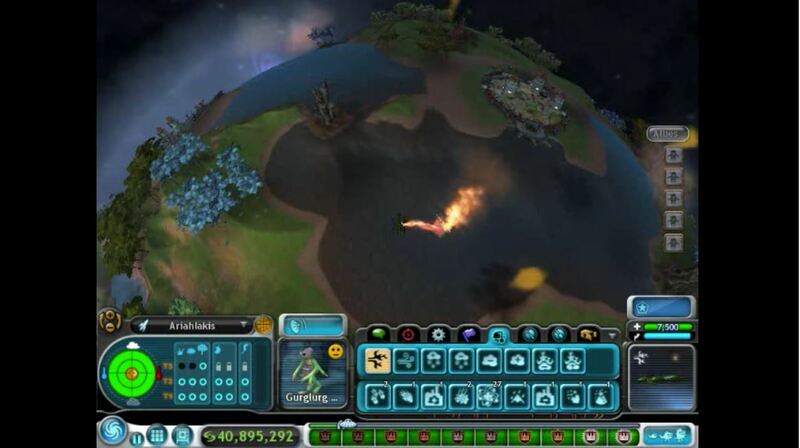 In the mainstream game Spore players can observe the impacts of climate change by using the terraforming mechanics. Who is the main target of such games? Are they targeted at specific age groups? Video games themselves are almost an ageless activity, most people can play video games regardless of age. Generally, serious disaster games are targeted more towards a younger audience; children, teenagers, adolescents in their mid-twenties. I think this somehow reflects the aim of such games to build disaster awareness in youth who may then share their experiences and games with parents or older age groups. Mainstream titles are generally targeted towards a more mature target audience. Are there any specific skills needed to play such games? – What? Stop disasters! is a game where players can build buildings on the beachfront or further inland and realise the risks involved for such locations should a tsunami strike. 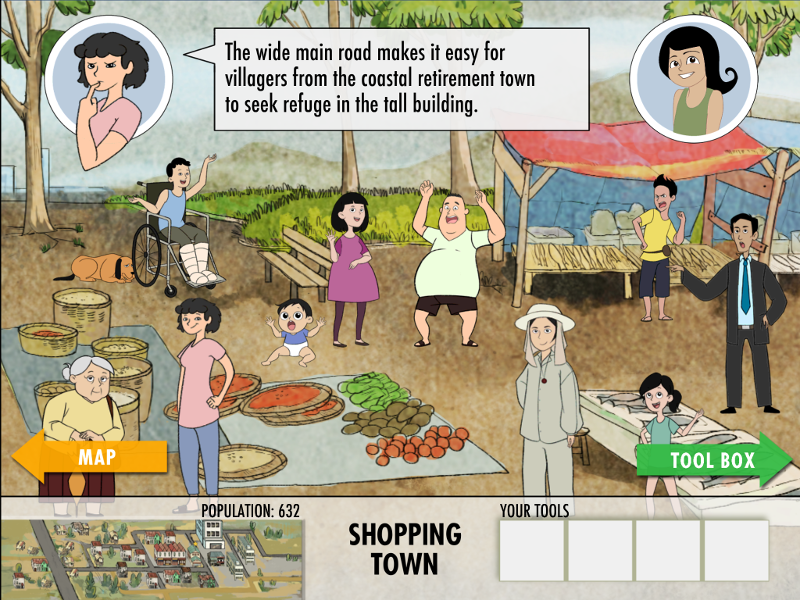 With serious disaster games, having a basic understanding of disaster and/ or disaster risk reduction (DRR) concepts can be helpful, though players rarely need specific skills to play disaster video games. There is always an element of trial and error in the learning process. This allows players to construct in their own mind an understanding of how a potential disaster situation may unfold and how to best respond or prepare. I think a positive attitude, ability to accept failures and motivation to learn how to improve is probably more beneficial than any specific skills. What are the most important lessons that can be learned from playing disaster video games? There are numerous lessons that can be learned from playing disaster video games and I think these lessons are somehow individual to the experiences of each player and may vary depending upon gameplay. Some people find an experimentation aspect important, a serious game example being Stop Disasters where players can build buildings on the beachfront or further inland and realise the risks involved for such locations should a tsunami strike. Mainstream games like the Fallout or Metro series provide lessons in community resilience following a disaster event, reflecting real-life recovery situations. Therefore, lessons learned are more individual and depend upon the experience, the person and the game. What sustainability goals can be achieved by playing such games? Somehow, disaster video games touch upon most if not all of the 17 sustainable development goals, of course dependent upon the game played. To some degree, mainstream disaster video games probably touch upon more of the sustainability goals then their serious disaster video game counterparts. Generally, this may be due to the sheer game size and ability for mainstream games to include more details and player flexibility versus the more specific direction taken in serious disaster video games. What psychological and social processes may happen in and between players while playing such a game? The inclusion of babies, elderly and disabled people in can result in players questioning what happens also to other groups of people. Due to the requirement of active participation, experimentation and play, players have to make decisions that may draw upon different areas of their understanding such as morality, risk and consequences. However, all decisions build up the players understanding in regards to personal improvement but can also extend to helping guide other players in improving or discovering new aspects. For example, the inclusion of babies, elderly and disabled people in EarthGirl 2, resulted in players questioning what happens not only to these groups of people in a disaster but also to prisoners, the homeless and patients in operating theatres. Therefore, such video games can create a dialogue between players, as they become more aware of particular issues surrounding them. While video games may be considered solo activities, they are also often social activities and therefore can increase conversation between players who may be playing cooperatively in the same room, voice chat within a game or even over discussion on the internet. Pokemon Godemonstrated this perfectly with complete strangers coming together to discuss, create maps, catch Pokemon as well as carrying out many other activities with each other. Can you give any advice on how to facilitate disaster games and workshops? From my experience of facilitating multiple disaster video game sessions and workshops, I think the best advice is to let players explore without restrictions, especially in regards to shaping their gameplay experience. Allowing players to make their own decisions whether the facilitator may consider them good or bad, ultimately helps players build their own personal awareness and understanding. Players attending these sessions will use these decisions to create a dialogue with their fellow peers, which may lead to cooperation or competition but, most importantly, conversation. As far as the follow-up after a video game session is considered, I have found it is important to hold a debrief, often using various participatory tools like a carousel. It helps foster ideas and opinions and empowers the players, as they have an opportunity to allow their voices to be heard. What, in your opinion, are the key elements of a serious game? The key element of a serious game is probably purpose. There is a message that players should, by the end of the game(s), come away knowing. Though, there is a balance needed between a purpose and fun. Too often, I find the importance of the message forced upon players with overwhelming amounts of information, so playing the game feels like forced learning and the experience becomes devoid of any appealing or fun element. A serious game that has an underlying message or purpose but is surrounded by a non-restrictive environment for players to experiment and have fun within can help get the message across without feeling like learning. What do you think are benefits of game-based learning? There are a multitude of benefits to game-based learning, but I think the opportunity for experimentation and self-directed or self-regulated learning based upon a players personal motivations or agenda is one of the best benefits of game-based learning. What is your favourite serious game, and why? There are a few serious games which I like different aspects of, in terms of mechanics, content, social interactions, skills and motivations, though I did find Sai Fah – the Flood Fighter an enjoyable game. The game follows the main playable character Sai Fah through the pre flood preparations, during the flood and after the flood. The game has quite a fun and bubbly feel to the narrative with easy to use controls and puzzles to solve. The game has an overarching DRR focus and presents messages throughout the game but are not so forceful that they become overwhelming to the player or detract from the gameplay experience.